We are catching up on three reveals: the Paladin Legendary champion, a Neutral Epic minion with Secret Synergy and a Rogue spell! This is probably the most exciting card revealed so far! 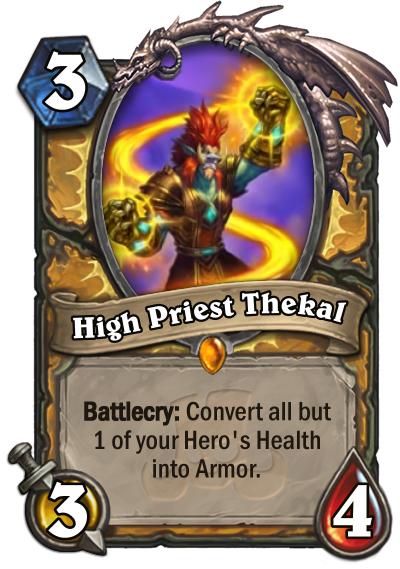 High Priest Thekal combines premium stats and a Battlecry that enables Paladin's healing spells, as well as increasing your maximum Health. It works great with Zandalari Templar, as well as cards from previous expansions like Crystalsmith Kangor and Benevolent Djinn. Of course, let's not forget Paladin's Classic healing spells and his signature weapon Truesilver Champion - unfortunately all of those are Even cards, whereas the High Priest is odd. Control Paladin has all the tools it needs to be a strong archetype in Rastakhan's Rumble. The following card was supposed to be revealed later today, but it was shown ahead of schedule. The leak was made by ZoomHS; his video is in Spanish. The Battlecry is definitely powerful if its condition is met. This might be tricker to do on curve/turn 3 but easier later in the game. Let's examine all classes that have Secrets along with this card. Mage Secrets don't curve too well with Masked Contender. Paladin Secrets are garbage if you draw them and Paladin already has a similar card, Bellringer Sentry, which hasn't seen much play. Rogue doesn't have enough Secrets. Lastly, Hunter Secrets are the ones that work better with Masked Contender, but the Battlecry doesn't count towards the Hunter Spellstone. Despite just listing all the negative aspects of this card, most people consider it the sleeper card of the set. 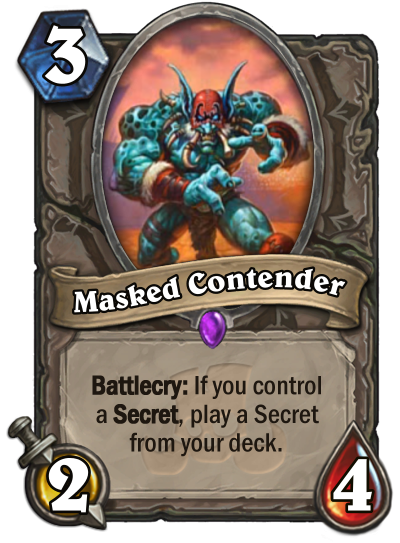 Masked Contender can be a valuable addition in Secret decks in Wild mode. I love the flavour of this card! Because of the condition, it's not that much better than Assassinate, a card that has seen virtually no play. It's an even card though and it works well with the other Rogue Spells, so perhaps we might see it in an Even Miracle Rogue deck. Perhaps an Even Pirate Rogue deck could also work, since Cannon Barrage is 6-mana, but the powerful Raiding party is at 3-mana. Vilespine Slayer is also rotating out of Standard in half a year and although Walk the Plank pales in comparsion to the Vilespine, it might actually be a decent-ish replacement. 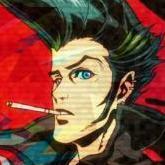 Wow, high priest is pretty spectular. Pretty cool, should be some interesting Paladin decks to play, though not a big fan of the synergy with molten giant in wild. I don't think high priest is going to be that great. Yes it covers up a lot of control/healadins weaknesses, it still has problems. The first being, a lot of your deck is still really bad against control, it just doesn't cease to function (unless of course you don't draw the high priest), and it allows you to survive a lot of OTK's, but. Control paladin just lacks a strong win condition. My own personal thoughts (and this probably won't work but hey this is a thought experiment for SCIENCE!) 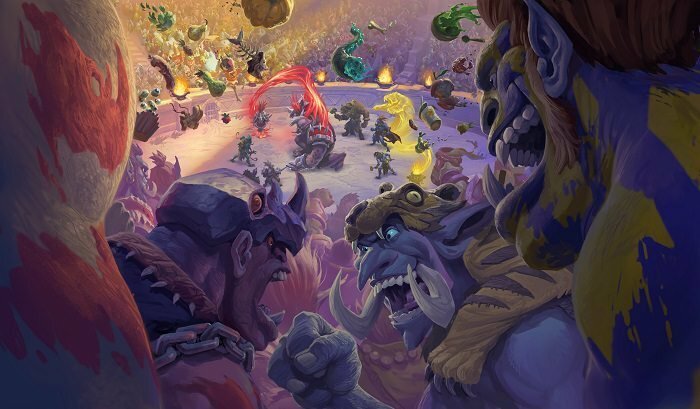 would be to run a strong anti aggro/healadin shell with all the new bells and whistles that are being added. Then for a win condition run Haakar the soul flayer. THEEEEEEN also run Prince Liam, which gives you an incredible amount of inevitability. Seems worth trying. As for masked contender, are we sure that it does not count for the spell stone? It does say play, and if it happens to, it is amazing, if not, then I don't know if it will see play in hunter (which is the only class that could reasonably run it imo). Still has a lot of value in secret hunter as an on curve play, and quite a few hunter secrets aren't triggered the turn you play them. I could see it, don't know if it is an op sleeper, but definitely has potential. I love walk the plank. I don't think it will see much play in a world where vilespine exists, unless you really want a third copy for some reason, outside of a few niche decks, most notably maly rogue, since they only want to run exactly two elven minstrels, 1 illusionist, and maly for creatures. Might become quite good after rotation? Seems solid though, basically a 4 mana Assassinate. 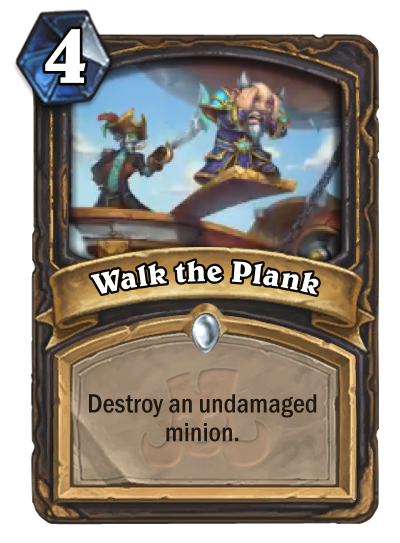 Hmm "Walk the Plank" could very well be a Classic-Card. It's basic, it does its job, it's not too exciting. Strange...it feels like always when a card is reveald in a new set that says something about "secrets" people get super hyped. I don't really get it. Its conditionel, the stats are quite bad and it forces you to play crappy secrets in your deck. Thekal is great though! If there will be a Heal-Paladin-Deck, he will be an inportant part of it. I don't know if a deck like this would be great, but since Murloc-Paladin I really enjoy playing control with this class. As for masked contender, are we sure that it does not count for the spell stone? It does say play, and if it happens to, it is amazing, if not, then I don't know if it will see play in hunter (which is the only class that could reasonably run it imo). The wording of the card is a bit dodgy, but the consensus is that this doesn't trigger the Spellstone because for that you have to play Secrets from your hand, not have a card play them for you. Also, good point on a Prince Liam Hakkar deck - the devs mentioned in the Hakkar reveal interview they playtested this kind of deck.